Also known as Holy Thursday or Good Thursday, Maundy Thursday has been celebrated since the earliest days of the Christian Church. 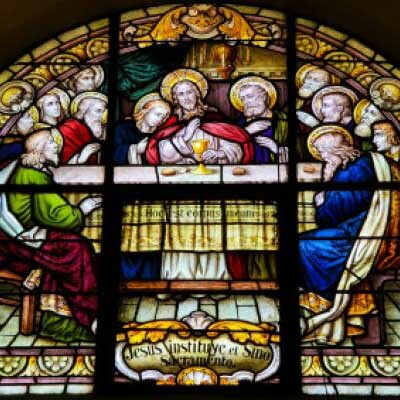 It commemorates Jesus’ last supper with his disciples and the institution of the Lord’s Supper and established the ceremony known as the Eucharist. In Spain, it is generally a public holiday in all regions apart from Catalonia. Preceding Good Friday, it also played a role in rural customs. A popular assumptions is that it is called “green” Thursday because of the green vegetables, people eat on this Fastday, spinach being a favorite. In Germany, the tradition is to eat a big fresh salad. Catholic churches do not ring their bells, they fall silent until Easter. The place of the bells is taken by rattles and other noisemakers, which call the faithful to service. “The bells have flown to Rome,” people would say. In the United Kingdom, the tradition of the sovereign giving alms to the poor on Maundy Thursday stretches back to at least the 12th Century and there are continuous records from the reign of King Edward 1. From the middle ages, the number of recipients mirrors the sovereign’s years. In 2013, Queen Elizabeth II, 87, will present Maundy Thursday alms purses to 174 people – 87 men and 87 women. From about 600 AD St Augustine noted the ceremony also involved the king, queen or their representative washing the feet of the poor. This foot washing tradition continued until the 18th Century. Even today nosegays or posies are still carried in the royal procession – a reminder of when foot odour needed disguising! The distribution of the alms comes in two parts. The red purse contains an allowance in place of food and clothing given in bygone times. In the white purse there are Maundy coins, as many pence as the Queen is years old. The coins are legal tender, but because they are so rare, they are sought after by collectors.